It’s starting to get cold in Marblehead. The heat has been turned on and the down comforter pulled out for the winter. The last few nights we’ve had mild frosts. I brought in two of my herbs for the winter. This is my first time bringing in plants. We’ll see how it goes. I’m sure the rosemary (above) will be fine but my giant flat parsley plant on my kitchen table (below) probably won’t like the filtered light indoors. I miss Marblehead – it’s my favorite town on the North Shore. I live in CA now and reading your blog always reminds me of my days in Boston. I love the table with the herbs. I currently have two topiary rosemary plants from Trader Joes with gourds for the holidays. I love how herbs smell and look when they grow wild. They tend to last longer than a bouquet of flowers. I used to live on the north shore of Boston (Ipswich) and left my parsley outside in the ground over the winter. I couldn’t believe it, but it never died! I would go out and see the snow sitting on its green leaves and wonder at the tenacity of this little plant! I live in the South now and my parsley is doing okay despite it getting a bit chiller here (but of course nowhere near the chill that you’ll get up there soon)! Maybe try an experiment of taking some parsley from your pot and planting it in the ground right now and see what happens over winter. It might not do so well because it won’t have a big chance to establish a root system, but you never know. I’m sick of buying herbs at the store for $3 when I only use two sprigs. Where are these herbs even from, cali? Often times I open the package from the store and they herbs are already moldy. I’m doing the same thing this week, though I only have oregano, mint and thyme to bring inside. The oregano will need to be put into a planter, but that’s fine. Now, if I can just remember to water these lovelies once they take up residence. My rosemary always gets infected with aphids because of the warm, dry climate indoors. I have since given up and dry whatever is left of the plant… I cheat and buy sprigs at the market in the winter. As for the parsley, I have to admit I have never seen plants being brought inside. Parsley is a bi-annual, which means they will return next year, and even usually re-seed eternally… which happens in my garden. I find it easier to make parsley pesto that I freeze to use up what is left and to buy parsley at the market… usually under a buck for the bunch even in the winter. But nothing beats the taste and look of fresh herbs… so good luck! Ha! It’s not really decorated. It’s just basically what I have. 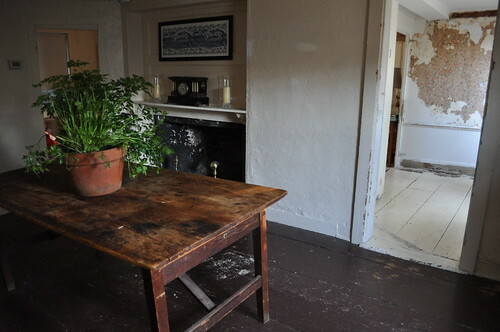 The floors need to be stripped, some of the plaster fixed, and the fireplace is caving in. Besides that it’s a great little room! That room in the second photo looks so beautiful. I love the way you’ve decorated. We did the same thing yesterday and are definitely feeling nervous about how they will do! Good luck with yours – they look beautiful and I am sure will do great! 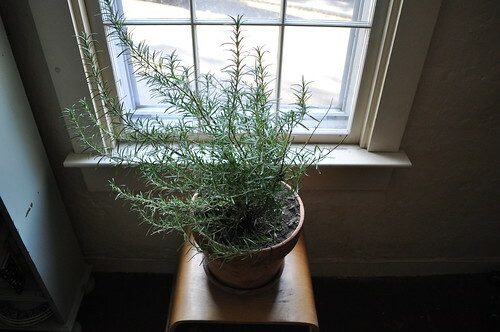 I have never had good luck bringing rosemary in over the winter. I really don’t know why. I hope you have better luck. My father suggested planting it (in it pot) in the ground and then wrapping it in burlap to protect it further. I live in an apt so planting it is not really an option, but I’m going to try to wrap it. Hope we are both successful! You have some nice, big healthy plants there! I live in an apartment, so my plants are always indoors (but sitting on the radiator next to the window). Each winter I wonder if the radiator-heat will kill them. It’s frustrating.